It’s been a while since I did a product review, predominantly because I didn’t have anything to review. Well now I do (actually two products, the other will be another article) the first of which is All About Program Design by Tim Henriques. Tim is the Director of the Virginia branch of the NPTI , The National Personal Training Institute, an online certification program. Tim is also the author of the book All About Powerlifting, a thorough and utterly comprehensive book on the topic that I have reviewed previously. When I say comprehensive I mean it, there are something like 40 pages describing the strict curl, a lift that isn’t common but is contested from time to time. FORTY PAGES. Anyhow. 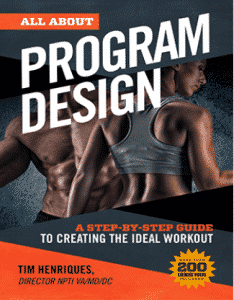 As part of his work with the NPTI Tim has written and released All About Program Design which, as the title suggests is aimed at just that. Let me make it clear from the get-go that this is focused on more general training as might be seen by the general public or what the typical personal trainer might be utilizing. It is not sports or powerlifting specific. 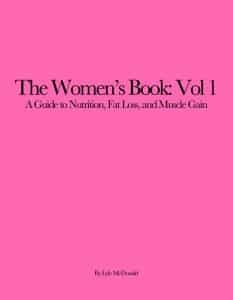 The book itself is 152 pages and takes a good look at the different components of fitness (strength, endurance, body composition, endurance, flexibility) along with subcomponents (power, explosiveness, speed, agility, quickness). We might quibble gently over terminology here but that’s nitpicky even for me which is saying a lot. Next the book provides an overview chart of how the different components/subcomponents of fitness would be loaded in terms of number of exercises, reps, sets, loads and rest interval. In one way this seems out of place in that it comes before the discussion of the other components but in another it provides a fantastic overview of each one. Having read the book, you can refer back to this chart and have all the information in one place. The specific terms such as sets, reps, tempo, etc. being used in the book are also defined in this section and I do want to specifically comment on that. In my experience, there are many training books or manuals that come out that don’t do this. No, I’m not naming names but it’s not uncommon to see people comment that the book was good except for the fact that there was terminology being used that was never explained.